Going to the Green City Market here in Chicago is one of my favorite ways to spend a morning. I have my regular routine. First I go to the lamb and goat man. Perhaps get some duck eggs. I get some cheese, taste some fruit, buy some veggies, and get a treat. Usually my treat comes from the Seedling stand and is a cider and fruit smoothie. I try not to buy cheese. I usually fail. The last time I went to the market I found three delicious cheeses. The first is Saxony from Saxon Creamery in Wisconsin. It's a raw washed rind cow milk cheese and has a nutty and slightly sweet flavor profile. Similar to a savory almond milk. Please take a minute and read the story behind this company. They love their animals, and the land and it shows in the end result. This was my first time having anything from Saxon Creamery but I know that I'll be back for more. Up next is Roxanne. I'll give you some time to go to your itunes and search for the famous Police song. Okay, shall I continue? 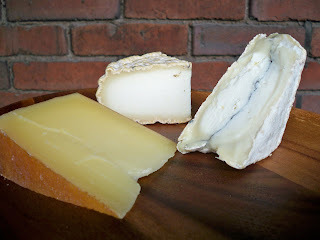 Roxanne comes from one of my favorite cheesemakers, Prairie Fruits Farm here in Illinois. while I am familiar with most of Leslie's cheeses, I'd never had this one before. This is done in the style of a Brebis from the Basque region of France. 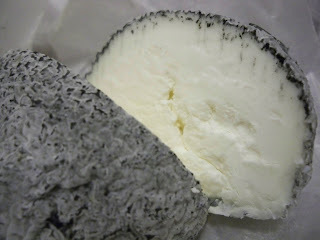 Leslie is a farmsteading goat cheese maker but for this cheese she uses sheep's milk from an Amish dairy further south. This cheese is very rich without being heavy. Because it's sheep milk, it has a rounder mouth feel. Since the milk comes from pastured animals, it has some of that green grassy, sweet clover quality to it. Not too gamy, and just a slight nuttiness to it. The rind was really interesting. It had a sort of wet stone quality to it. Mineraly. Last up is Krotovina. One of my favorite cheeses. 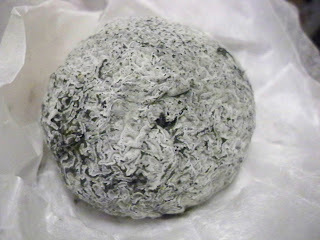 This cheese has goat's milk and sheeps milk separated by a line of vegetable ash. Soft bloomy rind cheese that ripens from the outside in. A slightly sweet fatty, lactic, goaty, acidic, spreadable pyramid of good. The orange-brown rind cheese on the left is Saxony, in the middle, Roxanne and on the right, Krotovina. This is the whole wheel of Roxanne. Isn't she pretty? Right behind her is a little pyramid of Krotovina. So what is vegetable ash? It's just what it sounds like. Vegetables are dried, and turned into ash which a cheesemaker then buys and incorporates into their cheese. The real question is why? Why add ash to a cheese? There are a couple of reasons. I think that the primary one is because it looks awesome. Here in America Humbolt Fog is probably the most famous of the ash cheeses. For me though, the first cheese I ever saw with the ash line was Morbier from France. 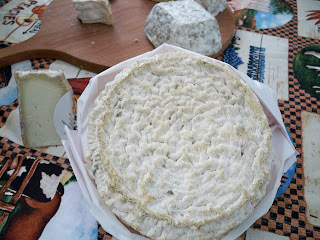 Traditionally, the cow's were milked and the ash was used as a protectant for keeping the curds safe from unsavory elements, and to keep them from drying out. In the morning the cows were milked again, and the mornings curds were put on top of the ash. Nowadays most Morbier is made from one milking, but the ash line is still present. I have been told that ash is an alkaline substance that neutralizes acidity. Acid is one of the most important factors in making a cheese. Too acidic and your cheese might not ripen. Adding vegetable ash can help balance a cheese. One of my favorite cheeses in this category is Wabash Cannonball from Capriole in Indiana. This is a little cheese with a lot of flavor. I really like the exterior. Looks a bit like brains. This is a good cheese for distracting zombies if you're under attack. Beautifully white and creamy. A good balance between acid, salt and cream. Good for eating alone or one of my favorite things to do with this cheese is to toast up some hearty bread (sourdough works really well) add a bit of the Cannonball, and a small drizzle of honey. Delicious!